For this month’s Mixology Monday, hosted by the Stacy Markow blog, we get to play with the theme “Smashes” (read the whole post here). You guys might have noticed I’ve had a couple Smashes on here lately, reason being that summer is one of the best times for making these drinks because they highlight so many of the awesome seasonal ingredients that are around. I always love berries in these, but for this month’s challenge, I wanted to mix it up a bit. And right now sweet corn is in season. Oh yeah, corn. In a cocktail. 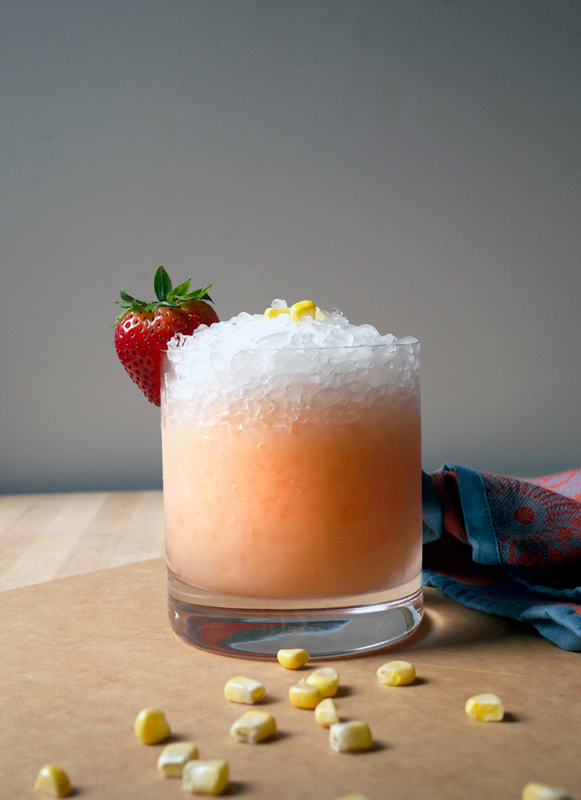 I only just heard of a few cocktails that use corn as an ingredient, but after poking around the internet for a little bit, I noticed that using corn isn’t SO new, it’s just not done that much. Here’s the trick though for getting this to work: please buy your corn from the farmers market where it’s in season and is super flavorful. Otherwise, it’s not going to pop in flavor and will just be a waste of time. You’ve been warned. Strawberries are also in season and I just can’t help myself. So I’ve mixed them in this cocktail with the corn for a little sweet-tart flavor. Hey, it works in the salads I make, and it works here too. So let’s embrace summer produce before it all goes away and we’re cursing the early setting sun and I try to tell you how awesome winter squash cocktails are. Get shuckin’! In the bottom of a mixing glass, muddle together strawberry slices, lime juice and simple syrup. 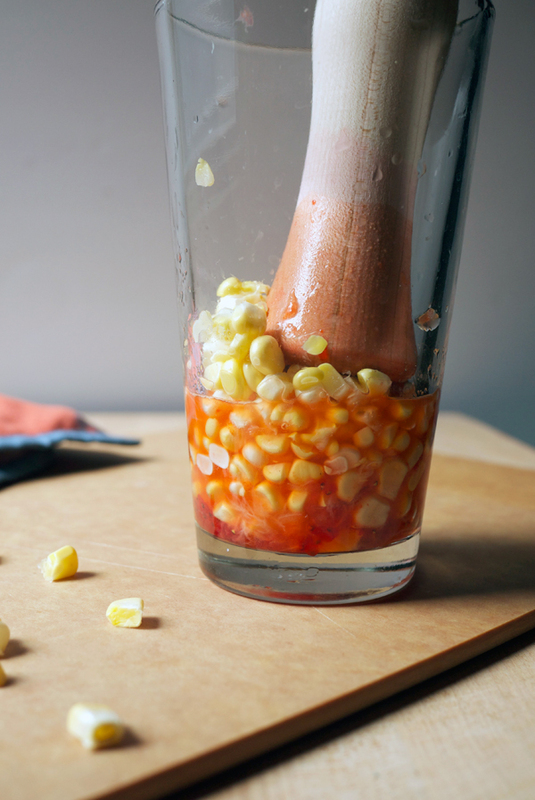 Add corn kernels and muddle until broken up (some kernels will remain whole). Add rum and bitters. Fill glass with ice and shake hard for about 30 seconds. Double strain into a rocks glass, fill glass with crushed ice, and add strawberry garnish. 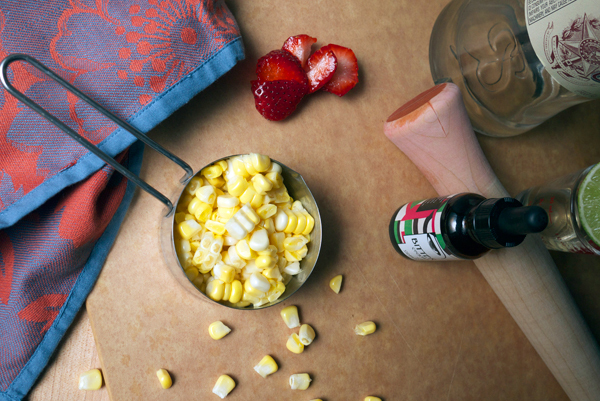 The corn is sweet and subtle and pairs exceptionally well with the strawberry. Be careful not to use too large a strawberry so that there’s a balance of flavor. The strawberry can be overpowering if you use too much. Overall a light, refreshing cocktail that can be savored without feeling too watered down with all that ice. The bitters add some extra juicy strawberry sweetness with a kick of heat from the chili. Thanks to Stacy for hosting this month and Fred for keeping this cocktail party going. Can’t wait to see what everyone came up with this month! This is brilliant! Definitely one of those “duh” moments – why haven’t I thought of this??? Thinking this would also be delicious with bourbon… ah, off to go and experiment!!!! I am so into this idea. Well done, ma’am! Digging this BIG time, Elana. Can’t wait to give it a go. Corn and strawberry? I think I just found my new cocktail. Also, your site is going to become dangerous for me – I love it. Thanks so much! This is the epitome of summer cocktails for me. Such an original cocktail… looks so delicious!